Mid-Town New York office seeking Documentation Processor with approximately 3 years experience. Click here for details. Leasing News is getting e-mail that a major independent leasing company is behind on broker commissions, several since February, 2008, plus other “complaints” about not being paid. very well-known to the leasing industry. Will keep information confidential and try to help you get paid. Strong sales and leadership skills; demonstrated with sales training and sales performance. Lead team in both regional and national operations and developed marketing programs. Sales Executive or Senior Manager, with responsibility for leasing capital equipment in support of transactions based on current market values, market potential and economic trends. Timing of the sale of common and convertible preferred leaves one observer saying the banking giant was "desperate." CIT Group Inc. boosted its total capital-raising — through sale of $1 billion of common stock and $500 million of convertible preferred — by 50 percent from the infusion that it had originally planned. 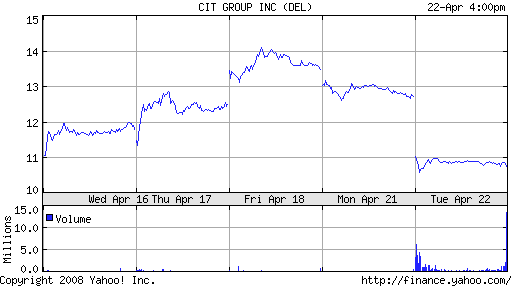 The CIT common was priced at $11 per share, down more than 18 percent from its closing price of $13.50 on Friday. Such heavy dilution has become commonplace of late among financial institutions looking to shore up their equity capital. Some market observers saw timing as the reason for the price fall-off. "You have to figure CIT is desperate to raise capital," said Gimme Credit, in a report issued Tuesday morning. "If not, we can't imagine why it chose yesterday to announce a new offering, considering investors were still reeling from National City's dilutive $7 billion private equity infusion." As we reported yesterday, the Cleveland-based banking giant said it is raising of $7 billion, including $985 million of private equity capital from Corsair Capital, which specializes in the financial services industry. The global commercial finance company intends to use proceeds from the common sale for general corporate purposes, including $8 million to pay dividends on its outstanding preferred stock for the second quarter, and $23 million to pay interest on its outstanding junior subordinated notes in the third quarter. Proceeds from the convertible preferred sale will be used for general corporate purposes. The convertible preferred will pay cash dividends at an annual rate of 8.75 percent. Each share will be convertible at any time, at the holder’s option, into 3.9526 shares of CIT’s common stock, plus cash in lieu of fractional shares. This is equivalent to an initial conversion price of about $12.65 per share of CIT’s common stock. After June 20, 2015, CIT may convert some or all of the convertible preferred stock if its common stock closes 150 percent of the then conversion price for 20 trading days during any period of 30 consecutive trading days. J.P. Morgan Securities Inc., Morgan Stanley & Co. Incorporated, Lehman Brothers Inc. and Citigroup Global Markets Inc. are serving as joint book running managers of these offerings. field. They finally did receive approval for an industrial bank in Utah. Now they plan to issue new stock and re-elect the board of directors. 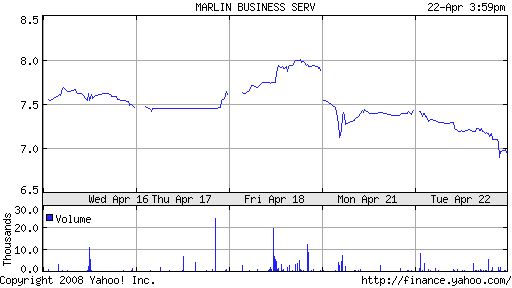 In a April 22, 2008 filing with the Security Exchange Commission, Marline refers to its efforts to issue 3,300,000 shares from their current 2,100,000. In the filing, they request it be 1,216,288 shares. Marlin also requests an increase in the shares made available to existing officers and directors as part of additional compensation. Evidently reading the SEC filing, the stock fell to a low of $6.96 from a previous close of $7.43, falling as far as $6.88 from a high of the 52 week range of $24.29 on volume of 49,894. About the Company: Advantage Funding is the leader in automotive and equipment lease financing, Lake Success, NY. Hiring experienced or new to business sales reps. Transactions in all states / all industries. Send resume to: info@sterlingcap.net or fax 631-414-7571. To view Leasing Association Conferences in 2007, please click here. Unless you are in a location where you cannot make a personal call, you will be wasting your time on the telephone in today's economy. The days of buying a “list” and then by shear numbers falling into someone looking for financing are going to be extremely tough. The credit cards and letters offering $150,000 lines of credit will also be affected. The companies who by shear number just throw untrained or newly trained sales crew to man the telephone boiler room will be the first to be hit. At best, they will be winding up more and more with “C” and “D” credits, finding them more and more difficult to get financed. Plan to spend at least two days on the street. So what do you do? Plan to spend at least two days on the street. Follow-up by card, telephone, internet, anything to keep your name there to contact you. Develop a new market plan. Used equipment always does better in a down marketplace. Read the classified ads in the local newspapers or in the classified on line, call those selling to see if you can help. 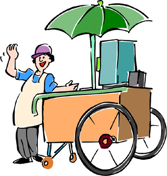 The idea is not just to pick up a customer, but a vendor. If you find a customer that you have rapport and is selling to up-grade, you have a lead for a vendor. If you find a buyer and a seller, and it is a private sale, not a dealer (dealers advertise), work with a company who will do a private sale. If a vendor is in your town, ask him when is the best time of day to meet him. You want to understand what he sells as you may have customers from leases you or your company have completed; who are paying you on time. Start attending auctions in your area. Put flyers on cars parked nearby that you finance used equipment. Mingle in the audience. Look not only for bidders for future sales, but the dealers who attend the auction to see what equipment sells for. 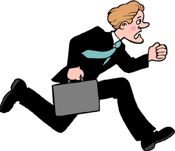 Go to bankruptcy sales, meet vendors and potential customers. Make friends with bankers, and creditors there, too. Hand out your business card. Work with a vendor for an ad on Craig's list or Ebay to help “sell” their equipment via financing. Tell them what you learned recently by attending auctions. How you can help them. Definitely make a routine about spending two days a week away from your telephone, calling on dealers, even if only three or four a day, due to traveling. Best time to call: 9:30am to 11:30am, 1:30pm to 4:30pm; use the in-between time to conduct current business. Stick to the plan. Work the plan. No goofing off, but change your day so you are committed. Just show up in person. Even if the dealer is working with another leasing company, I bet they are getting more leases turned down than before---and I further bet they have never met their leasing service representative---as everything today is over the telephone, fax, and the internet. Nothing beats eyeball to eyeball and making a friend. Hit the streets. Always hand deliver the check to the vendor. If you are a broker, most funders will allow you to do this as you signed a “reps and warrants” form. Most dealers don't care who is named on the check, but they have it hot in hand, personally delivered by you. Get off the telephone and start using your shoe leather. You not only will make sales, but survive in the rough times certainly ahead for the 12 to18 months. Make a plan. Work the plan. Steve Crane, CLP, has known Kit Menkin since his days at CIT, Taylor Leasing, and this year celebrates 13 years with Bank of the West Leasing. Steve travels the United States, located out of Bank of the West’s Walnut Creek offices, San Francisco Bay Area, California. He has many friends in the business and is well-known and respected in the equipment leasing industry. Steve joined the Leasing News Advisory Board on July 10, 2000. He has been active in sponsoring conference calls, attending meetings and promoting our trade publication. He travels more and more, for his bank, seems to enjoy seeing his many friends in the leasing business, but he will be the first to tell you he would rather be with his family. His main love is his family, then the outdoors. "I enjoy doing many things with my family including cooking, watching movies, traveling and attending sporting events,” he said. 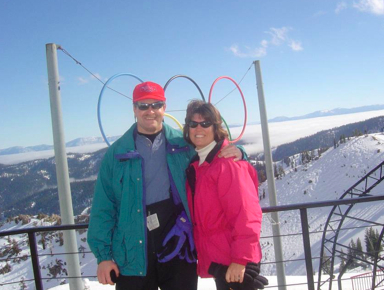 He celebrates 25 years marriage this year to his college sweetheart, Cheryl, planning a special trip, perhaps to South America, he says. 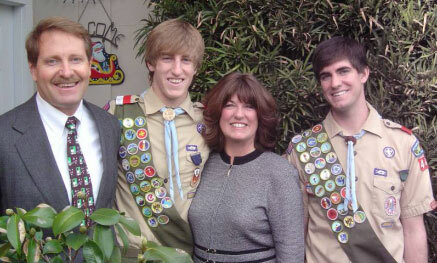 Steve with his wife Cheryl and sons Alex and Ryan. 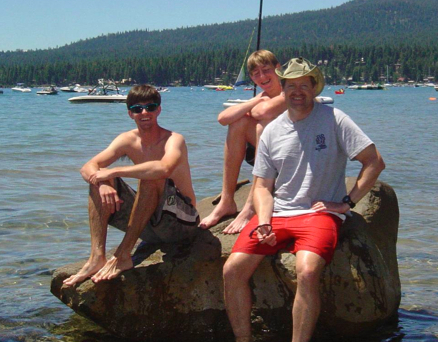 They have two children: Ryan, who is a sophomore at Chico State. 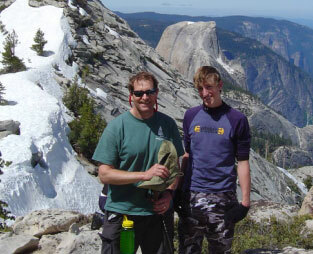 Steve with his son Alex near the Clouds Rest peak in Yosemite, overlooking half dome. He and his sons are planning in August, to ascend Mt. 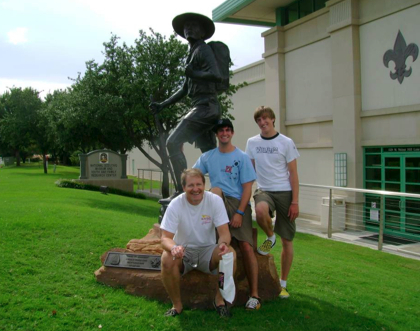 Whitney with his sons, the highest mountain in the lower 48 states..
"I love the outdoors and am an avid runner, cyclist, swimmer, backpacker and skier. I particularly like to backpack, canoe, and hike. 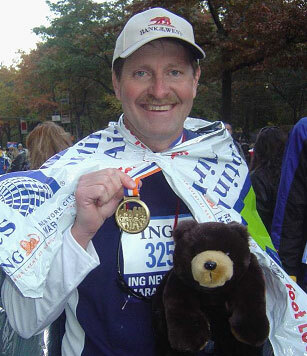 Steve keeps in shape as a “recreational runner,” typically doing three to five miles daily, even when he travels. The year before he competed in the New York City Marathon, 26.2 miles. (1) What was the biggest issue you currently face in your business? 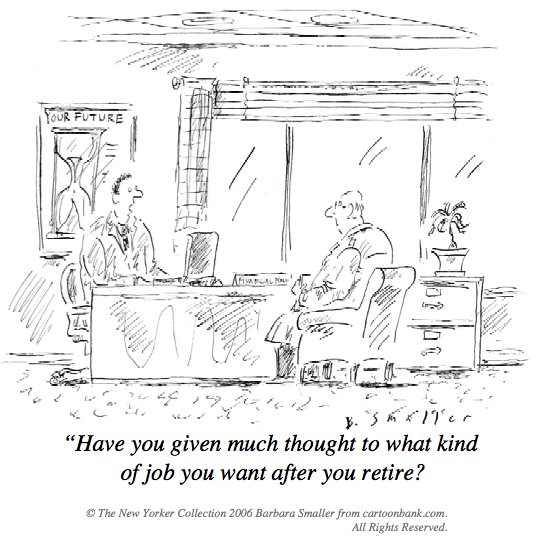 (2) What advice would you give a younger person entering the field? (3) What attributes do you possess that contribute to your success? (4) What do you want to do before you die? "This is a tough one for me – I would like to say that I want to climb Mount Everest or finish the Ironman Triathlon in Kona, but that is probably unrealistic due to my advanced age. Steve Crane has been in the equipment leasing industry for over 25 years. He currently holds the position of Vice President and Marketing Manager for Bank of the West in the San Francisco area, where he has been for almost 13 years. "I thoroughly enjoy my job and Bank of the West and working with the numerous brokers and lessors from whom we source our business as well as the wonderful group of people in my office." In 2003, he was elected to the Eastern Association of Equipment Lessors board of directors. 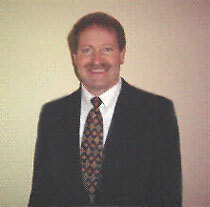 In 2004, he served as Conference Chair for the UAEL Fall Conference in Monterey. He is proud to note that he attends many of the Association of Government Leasing and Finance, Eastern Association of Equipment Lessors, Equipment Leasing and Finance Association, National Association of Equipment Leasing Broker, and United Association of Equipment Leasing conferences and meetings. DELRAY BEACH, Fla.--NYSE:ODP), a leading global provider of office products and services, announces the launch of a new office equipment and furniture leasing option for small business customers in North America. The new SmartWayLeasing(TM) service, delivered in partnership with specialist international leasing business ThinkSmart, is currently available in select Office Depot retail store locations in the Greater Tampa-St. Petersburg, Florida area, with nationwide expansion expected during the year. SmartWayLeasing from Office Depot is the first small business product leasing solution available through an Office Supply Superstore. Office Depot's SmartWayLeasing enables small businesses to save thousands of dollars of upfront expenses by providing them with the option to lease office equipment, including computers, peripherals and office furniture. Customers can select from a three or four year term and can choose from a wide variety of equipment ranging in price from $500 to $10,000. At the end of the lease term, the customer has the option to either renew the current lease, return the equipment, or upgrade to new equipment. "Small businesses are facing many challenges with the current economic environment, and the new SmartWayLeasing option from Office Depot will help to provide these customers with the flexibility needed to stretch their equipment budgets further," said Chuck Rubin, President of North American Retail for Office Depot. "Small business growth is a critical component that fuels today's economy and Office Depot understands the small business customer better than anyone. That's why we continue to look for new and innovative ways to partner with our customers and help them to succeed." Small businesses can also include important core supplies such as ink, toner and paper as part of their SmartWayLeasing plan. Approval takes place directly at Office Depot retail locations, with most approvals taking less than 10 minutes. Customers can take in-stock merchandise with them the same day, with the exception of large items such as furniture that can be scheduled for delivery. For more information about Office Depot's SmartWayLeasing plan, please visit www.officedepot.com. Every day, Office Depot is Taking Care of Business for millions of customers around the globe. For the local corner store as well as Fortune 500 companies, Office Depot provides products and services to its customers through more than 1,600 worldwide retail stores, a dedicated sales force, top-rated catalogs and a $4.9 billion e-commerce operation. Office Depot has annual sales of approximately $15.5 billion, and employs about 49,000 associates around the world. The company provides more office products and services to more customers in more countries than any other company, and currently sells to customers directly or through affiliates in 43 countries. Office Depot's common stock is listed on the New York Stock Exchange under the symbol ODP and is included in the S&P 500 Index. Additional press information can be found at: http://mediarelations.officedepot.com. ThinkSmart is a leading international financial services company that is focused on the delivery of B2B finance products through the retail environment. The business currently operates with market leading retailers and financial institutions in Europe and Australia where it has built a reputation for processing high volumes of low value business finance transactions both quickly and efficiently. ThinkSmart is listed on the Australian Stock Exchange code (ASX:TSM). Spain: Book Day and Lover’s Day. Barcelona, Saint George’s Day and the anniversary of the death of Spanish writer Miguel de Cervantes have been observed with special ceremonies in the Palacioa de la Dispatacion, aand throughout the city since 1714. Books stands are set up in the plaza and on different corners. This is Spain’s’ equivalent of Valentine’s Day. Women give books to men, men give roses to women. 1. VW Beetle (U.S.)--sold 330 first year. 3. Cuisinart--sold 200 first year. 4. Remington typewriter--sold 8 first year. 5. Scrabble--sold 532 first year. 1989-"Baywatch" premiered on television . Set on a California beach, this program starred David Hasselhoff and a changing cast of nubile young men and women as lifeguards. Later the program was moved to Hawaii; the last episode was made in 2001. The most widely viewed TV series in the world, the program aired in 142 countries with an estimated weekly audience of 1.1 billion. 1635- the first public school in America opened, the Boston Latin School . The first schoolmaster was a Dutchman, Adam Roelantsen, who arrived in New Amsterdam in 1633 and set up the first school in America as part of the Dutch Reformed Church. The first secondary school was the Boston Latin School , with a classical curriculum derived from English schools. By 1720, five public schools were maintained in Boston , and were so well regarded they enrolled students from as far away as the West Indies . The Boston Latin School is still in existence. 1750-- The first colonial settlement west of the Allegheny Mountains other than military forts and outpost was established by the Loyal Land Company of Virginia . On March 6, a group of six men in the employ of the company, led by Dr. Thomas Walker, a physician, started out from Charlottesville , VA. They searched the future sit of Barbourville , KY , on April 23, and built a house that was completed on April 30. 1791- The birthday of James Buchanan, 15th president, born at Cove Gap, PA, who served from March 4, 1857 to March 3,1861,the only president who never married. 1813-birthday of Stephen A. Douglas, U.S. Congressman, Senator and presidential candidate who ran against Abraham Lincoln. He was in favor of the new territory and states being allowed to choose whether they wanted to be “slave” or “anti-slave states.” He is also very well known for the series of “Lincoln-Douglas” debates. 1856- Granville T. Woods was born at Columbus , OH . Known as the” black Thomas Edison,” he invented the Synchronous Multiplex Railway Telegraph which allowed communication between dispatchers and trains while the trains were in motion, which decreased the number of train accidents. In addition, Woods is credited with a number of other electrical inventions and historians do compare him favorably to Thomas Edison. Died Jan 30, 1910, at New York , NY . 1872-Charlotte E. Ray became the first African-American woman attorney admitted to the Washington Bar, o the Supreme Court of the District of Columbia . History also records her as the first African-American woman to receive a law degree, receiving her LL.B. degree from t e School of Law , Howard University, Washington, DC, on February 27, 1872. She opened a law practice, but both racial and woman prejudice forced her to close the office. She then joined the Woman's Suffrage Movement. 1896- The first move was shown at Koster and Bials Music Hall in New York City . Up until this time, people saw films individually by looking into a Kinetoscope, a box-like "peep show." This is the first time an audience sat together and watched a movie together. What they saw was a series of short scenes, including a ballet scene, a burlesque boxing match, surf breaking on the shore, and a comic allegory entitled," The Monroe Doctrine." Thomas Alva Edison was present for his Vitascope and the audience called for Edison , but he did not appear and refused to take a bow. 1907 - The steam laundries of San Francisco and vicinity, with the exception fo a few, remain on strike after more that four weeks. Soiled linen is becoming a serious problem in many households. The few laundries that are in operation were unable to call for or deliver washing. Patrons who took their wash to the laundries returned with the dirty linen. The strike does not appear mearer a settlement than it was three weeks ago. 1907 - Jack Londond, on board his yacht the Snark, pulled out into the harbor from the Franklin Street wharf at 12:30 today amid the cheers of is frineds and admirers. He stood on deck with his wife and small crew. 1915-birthday of pianist-arranger Joe Lippman Boston , MA . 1921-birthday of baseball Hall of Fame pitcher Warren Edward Spahn, Buffalo , NY . 1932-Bing Crosby records “Sweet Georgia Brown” with Isham Jones Band. 1941 - Birthday of Allen Cohen. Poet, editor of San Francisco Oracle, visionary, champion for peace and justice who inspired his generation. Allen died April 30, 2007. The memory of Allen Cohen will forever live in the hearts of those who loved him and all whose lives he touched with his poetry and his promotion of peace and love. 1942--Birthday of Sandra Dee, singer/actress/heart thrub to a generation. 1948-Johnny Longden became the first race jockey to ride 3,000 career winners as he set the mark at Bay Meadows in San Mateo, CA. 1954-Henry Aaron of the Milwaukee Braves hit the first home run of his major league career. It came against Vic Rosdchi of the St. Louis Cardinals in the Braves' 7-5 victory.. Not only did he raise the bar for home runs, but he also established 12 other major league career records, including most games, at-bats, total bases and RBI's. Aaron won three Gold Glove awards, earned National League MVP honors in 1957, and appeared in a record 24 All-Star Games. Aaron went onto hit 755 homes, more than any other player. Television commercial depict Barry Bonds chasing his record, and Aaron trying to frustrate him at batting practice. 1954-the NBA approved a proposal by Syracuse Nationals owner Danny Biasone to adopt a 24-second clock. The rule stated that “a team in control of the ball must make an attempt to score within 24 seconds after gaining possession of the ball.” Biasone promoted the rule to boost the league's offensive output. He decided on 24 seconds by dividing the total number of shots taken in an average game into 48 minutes, the time played in regulation game. 1956---Elvis Presley made his Las Vegas debut, opening for comedian Shecky Greene. Presley's two-week engagement was cancelled after a week because of poor audience response. Elvis would not return to Vegas for 13 years. 1963 - Pete Rose of the Cincinnati Reds got his first hit in the major leagues. It was a booming triple off the Pirates' Bob Friend. ‘Charlie Hustle' went on to break Ty Cobb's all-time hitting record more than 20 years later, playing for the Reds, the Phillies and the Expos. He was later banished from baseball for illegal betting. 1964 - Ken Johnson of the Houston Astros will certainly never forget this day. Johnson tossed the first no-hit game -- for a loss -- in baseball history. Cincinnati's Reds beat Johnson's no hitter by a score of 1-0. The Reds capitalized on two costly Houston errors. 1987 - "Business Week" magazine announced its list of the highest paid executives in the U.S. Lee Iacocca of Chrysler Corporation topped the list, followed by Paul Fireman of Reebok International. The computer revolution did not begin until the 90's, knocking most automobile executives way off the charts. 1988-the smoking ban on airplane flights went into effect. In compliance with rules issued by the Federal Aviation Administration, airlines banned smoking on domestic passenger flights lasting less than two hours, with the exception of chartered flights and travel club flights. Northwest Airlines voluntarily banned smiling on domestic passenger flights of all durations. The first commercial domestic air service that was entirely smoke-free, including the cockpit, was inaugurated by Delta Air Lines of Atlanta, GA, which banned smoking on all flights beginning January 1995. Other airlines adopted this policy in the following year. 1994-discovery of the top “quark.” Physicists at the Department of Energy's Fermi National Accelerator Laboratory found evidence for the existence of the subatomic particle called the top quark, the last undiscovered quark of the six predicted to exist by current scientific theory. The discovery provides strong support for the quark theory of the structure of matter. Quarks are subatomic particles that make up protons and neutrons found in the nuclei of atoms. The five other quark types that had already been proven to exist are the up quark, down quark, strange quark, charm quark and bottom quark. Further experimentation over many months confirmed the discovery and it was publicly announced Mar 2, 1995. 1999-- Fernando Tatis becomes the first player in major league history to hit two grand slams in one inning. The Cardinal third baseman hits both off Dodger starter Chan Ho Park in an 11-run third setting the major league mark. His eight RBIs in one inning also breaks the old record of six. In town one day, gone the next. By plane, by wire and less. "Now batting. The Centerfielder. Mickey Mantle." the Ol' Redhead, wised up, seen it all. In between clever McCarver and professional Buck. Look up, Bob. Look up. "Number 2. The shortstop. Derek Jeter. Jeter."